The Alastor 1 is named for the fact it has a single engine. The Alastor 2 and 3 are coming soon. This is the link to the video because somehow it won’t play here. Replaced the turbine shaft with a less draggy one. This is a fast turboprop with excellent range, ceiling and speed. 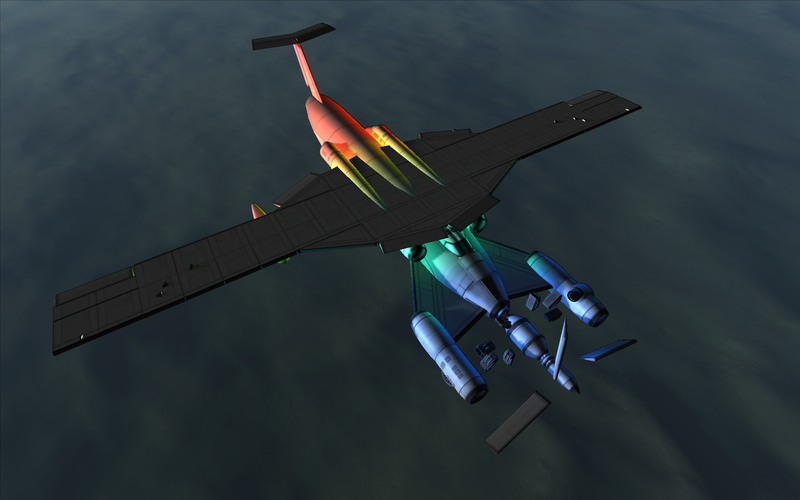 It’s also very agile, a STOL and capable of landing and taking off from rough terrain. The colour is a hommage to the doppler blueshift in astronomy. There are two types, the Azi33 Alastor 1 Cargo and Azi34 Alastor 1 Commuter. All specs are basically the same. Top speed (sea level, tanks almost empty:) 140m/s (Version 1.1: 145m/s). See the video for some flight instructions. Never forget: start your take off roll at 50% throttle. At 100% throttle and very low speed the propellor pulls an incredible 615kN on the bearings and shaft, they will most likely fail. Also: take a look at the action groups. Because the Alastor 2 and 3 have engines on the wings I’ve chosen to engage/disengage the propellors separately, for steering on the ground and emergencies. The Alastor 1 engine is started with action groups 2 and 5. The landing gear might seem weird but it’s very functional. You can change attitude with the rear main gear for easier loading/unloading cargo or kerbals. Retracting both main gear is meant for steering on the ground, you’ll see what I mean. Landing/taking off should always be done with the gear in standard position (rear main gear retracted) to reduce the risk of propellor strike.